I have not had a lot of time for blogging...Some health issues keep cropping up, but I have managed to get some beading done. Thought you would like to see the latest effort.. 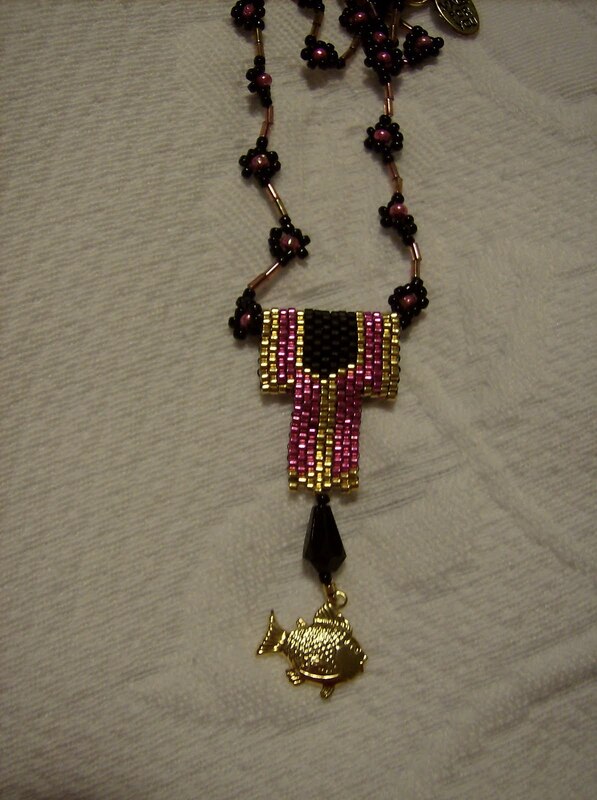 These are little kimonos made into a necklace . Shocking pink with 24 kt. 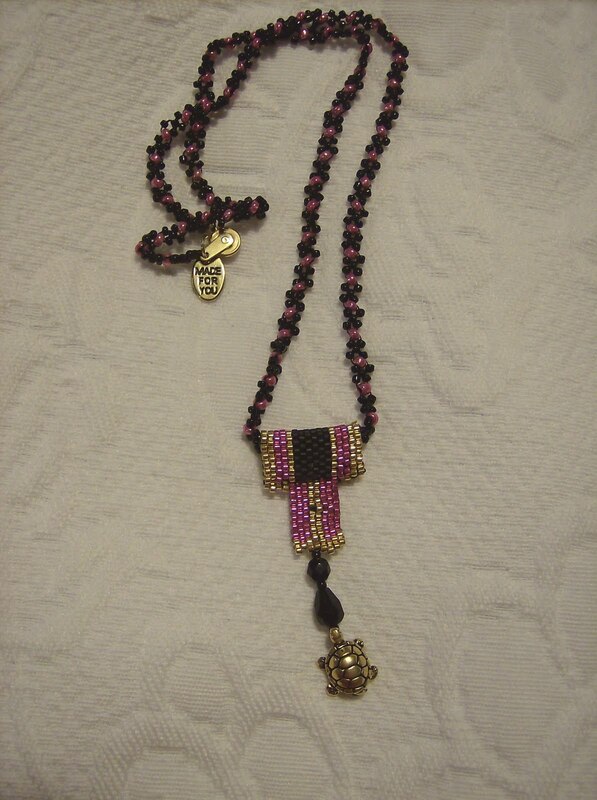 gold beads, and the second color combo is red and black with silver. 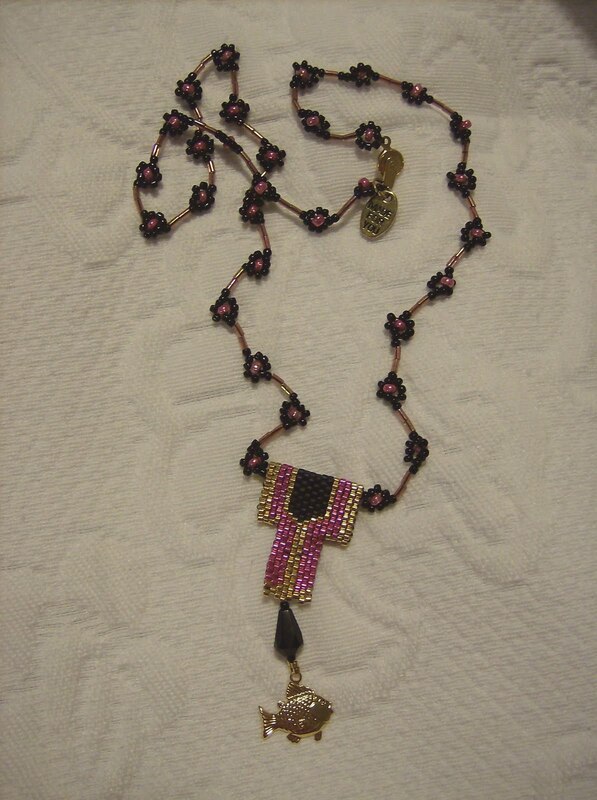 The 18 inch chains are made to resemble cherry blossoms... I will be adding them to my Etsy shop if anyone is interested. Maggie, your beading work is beautiful. Your are so good at the tiny work. You must have a lot of patience. Sorry to hear you are having health problems, I will keep you in my prayers. I was diagnosed with RA about six years ago, but I keep telling myself that I am healed and you can't tell by looking or being around me that I have RA. Try it, see if it will work for you. Take care of yourself and get plenty of rest. These pieces are quite lovely. 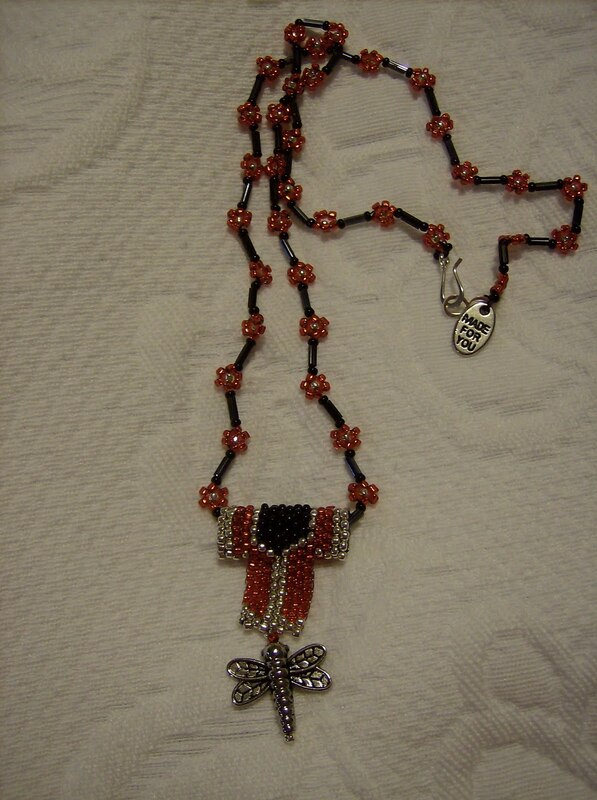 Beading must be like meditating at times. Take one bead, and then another. Your beading is always truly beautiful. Love them. I hope all is well in Ontario?? Here in Michigan the weather has been to HOT. Maggie your beading is gorgeous! !I am sorry your health hasn't been the best. I've only done a little bit of loom work, but loved it! !Love yours. I am sorry to hear you are not feeling 100 per cent. I hope all is well. Thanks so much for stopping by. So happy you liked my beading. Oh well to-morrow is another day. Maybe I will give it a rest for awhile..
Tatting Chic I cancelled my facebook account... Never paid it much attention and privacy was a concern so that's that. Sorry..
Judy, Nice to hear from you. I guess your trip to PEI will be coming up soon.. I know how much you love Anne of Green Gables.... Now I hope I won't see you wearing red pigtails when you come home!!!! Maggie, as always your work is exceptionally beautiful. You are such a talented lady -- and I so enjoy seeing all you do. I certainly hope your health issues have improved and you are doing well. You are in my prayers. Your kimono necklaces are just exquisite. Hope you are feeling better soon! Maggie your beading is beautiful as ever...hope your feeling better...your in my thoughts and prayers....HUGS!! Thank you for visiting my blog. You do beautiful jewelry work! Hope your health issues improve. 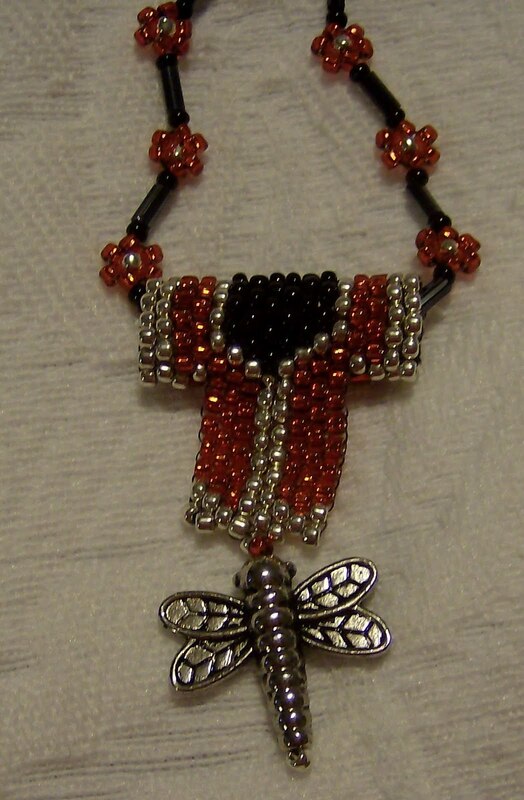 Beading can be great therapy. Beautiful!! Such talent, looks like tedious work! I am so sorry to hear you are having health issues. I shall keep you in my thoughts. Your necklace is darling. You always do such wonderful work. I would love to see your zentangle postcards and beads! I am enjoying my visit to your lovely blog this morning. You are very talented and in so many different things too ... a real delight! The necklace is gorgeous. How are you feeling lately? Better? I hope.